Radio-frequency (RF) signals are typically sinusoidal or nearly so - that is, the voltage or field is a smooth, periodic function of time. The number of times the signal repeats itself per second, the frequency, varies widely in differing RFID systems. Frequency is measured in Hertz (Hz): one Hertz is one cycle per second. The prefixes kHz= 1000's of Hz and MHz = millions of Hz are frequently employed. The figure below shows some of the common and less-common frequency bands in which RFID systems operate. Also shown is the corresponding wavelength - the distance between points at which the field has a fixed value when the signal moves at the velocity of light. Several issues are involved in choosing a frequency of operation. The most fundamental, as indicated in the diagram, is whether inductive or radiative coupling will be employed. The distinction is closely related to the side of the antennas to be used relative to the wavelength. When the antennas are very small compared to the wavelength, the effects of the currents flowing in the antenna cancel when viewed from a great distance, so there is no radiation. Only objects so close to the antenna that one part of the antenna appears significantly closer than another part can feel the presence of the current. Thus, these systems, which are known as inductively-coupled systems, are limited to short ranges comparable to the size of the antenna. In practice, inductive RFID systems usually use antenna sizes from a few cm to a meter or so, and frequencies of 125/134 KHz (LF) or 13.56 MHz (HF). Thus the wavelength (respectively about 2000 or 20 meters) is much longer than the antenna. Radiative systems use antennas comparable in size to the wavelength. The very common 900 MHz range has wavelengths around 33 cm. Reader antennas vary in size from around 10 to >30 cm, and tags are typically 10-18 cm long. These systems use radiative coupling, and read range is not limited by reader antenna size but by signal propagation issues. A second key issue in selection of frequency bands is the allocation of frequencies by regulatory authorities. In essentially every country in the world, the government either directly regulates the use of the radio spectrum, or delegates that authority to related organizations. In the United States, the Federal Communications Commission (FCC) regulates the frequencies that radios are allowed to radiate, the power levels they can use, and other more technical aspects of their operation. For much of the history of radio in the US, every radio transmitter needed a license from the FCC to operate the radio. However, in the mid-1980's, the FCC began to allocate certain frequency bands in which unlicensed operation would be allowed, subject to certain restrictions on the equipment and usage. Many other nations in the world have followed suit. This released a remarkable burst of innovation, including unlicensed cordless phones, wireless local area networks, and other devices. RFID systems are typically operated in unlicensed bands. In the US, unlicensed operation is available in the Industrial, Scientific, and Medical (ISM) band at 902-928 MHz, among others. The 900-MHz ISM band is a very common frequency range for UHF RFID readers and tags. It is important to note, however, that bands do not exist in isolation; for example, the figure below shows the various uses to which frequencies near the ISM band are put in the United States. The practical consequence of this proximity is the possibility of interference: for example, a nearby cellphone transmitting tower may interefere with the operation of RFID readers, due to the finite ability of the reader receiver to reject the powerful cell signal. (Cellular basestations may sometimes use transmit powers of 10's to hundreds of watts.) Other users of the ISM band may also interfere with RFID readers, or encounter interference due to them: examples are cordless phones and older wireless local area networks. Finally, changes in operating frequency affect the propagation characteristics of the resulting radiated fields. Lower frequencies diffract more readily around obstacles, but couple less well to small antennas. Radiated fields are absorbed by many common materials in buildings and the environment, particularly those containing water. The degree of absorption due to water increases gradually with increasing frequency in the MHz to GHz range. Tags immersed in water-containing materials (i.e. injected into or swallowed by animals or people) must use very low frequencies to minimize absorption: this is a typical 125 KHz application. For locating large objects or people outdoors, a relatively low frequency (e.g. 433 MHz) may be desirable to avoid obstacle blockage; when a clear line of sight from the antenna to the tag can be assured, a higher frequency may be useful to reduce the size of the antennas. Spectral allocations vary widely from one jurisdiction to another. Members of the European Union are usually guided by the recommendations of the European Radio Organization, renamed the European Communications Committee in 2001, and the European Telecommunications Standards Institute (ETSI). Canada and many other countries in the Americas often generally conform to the recommendations of the US FCC. Nations in the Middle East and North Africa often follow European standards. Asian countries differ widely. 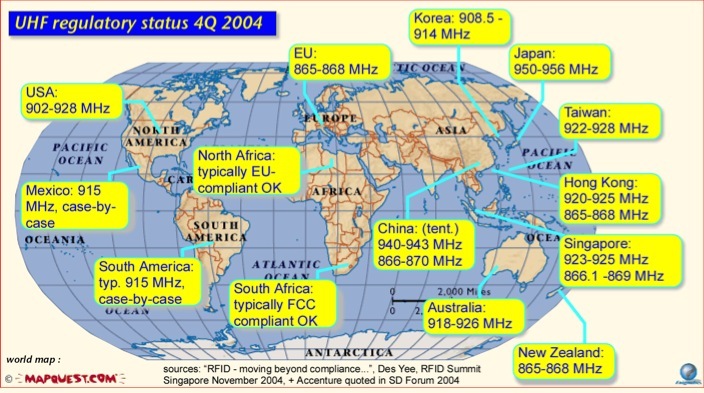 A simplified summary of RFID allocations in the 900-MHz region throughout the world is shown below.